A recent report from the Oregon Health Authority (OHA) shows Coordinated Care Organizations (CCOs) leading the way in their percent of medical spending on primary care. Made in collaboration with the Department of Consumer and Business Services, the new report utilizes information on primary care spending in 2017. The report describes primary care as “the front line of Oregon’s health care system.” By improving the availability of primary care services such as preventative screenings, early detection and coordinated care with specialists, research shows that primary care availability leads to improved health outcomes and reduced mortality rates. In 2017, the state legislature passed Senate Bill 934, requiring CCOs and health insurance carriers to allot at least 12 percent of their health care spending on primary care by 2023. The CCOs and carriers included in the report provide health coverage to 2.5 million Oregonians and spent approximately $1.5 billion on primary care out of $11 billion in total spending in 2017. Broken down, large commercial carriers averaged 13.4 percent spending on primary care, with spending ranging from 6.7 percent (Atrio Health Plan) to 16.9 percent (Kaiser Foundation Health Plan of the Northwest). 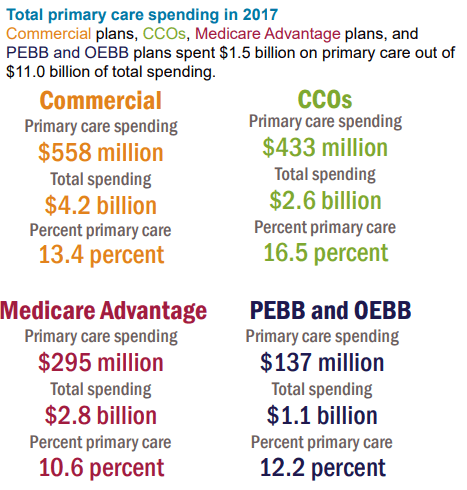 PEBB and OEBB averaged 12.2 percent on primary care, ranging from 10.8 percent at Moda Health Plan and 16.2 percent at Kaiser Foundation Health Plan. Medicare advantage plans allocated between 4.1 (Trillium Community Health Plan) and 22.3 percent (UnitedHealthcare of Oregon), for an average of 10.6 percent. CCOs averaged the highest percent of spending on primary care at 16.5 percent (ranging between 9.2 percent at Columbia Pacific and 23.8 percent at Willamette Valley Community Health). Non-claims-based payments, such as those made to providers to motivate efficient care delivery or to reward quality and cost-savings achievements, made up more than 65 percent of primary care spending by Medicare Advantage plans. Over 60 percent of primary care spending by CCOs was non-claims-based. PEBB and OEBB’s percent of non-claims-based primary spending was 45 and 36 percent, respectively.